I was lucky to see this first hand in a breakfast room at the NEC Hilton at BPM, so I was keen to see how this had developed. It's a cool thing to see in the flesh and to actually handle. Given that most software is much the same as each other, and very fixed in their approach, it's refreshing to be able to drop down menus and add features that you'll actually use, rather than curse because you can't switch off decks that you won't use. It's the workflow that is quite revolutionary. Obviously, it will have the regular building blocks of a traditional DJ setup, but also includes a production element where sets can be pre-built and played, or made on the fly if the need arises. It's this element that interests me, as whether you agree or not, it indicates the direction of DJing. We find ourselves in a time of flux where DJs and producers are heading towards a middle ground, where it's no longer enough to just play one track to another. Crowds are becoming more sophisticated and want more from their DJs. Thus tools traditionally being used to make music are now being used to play music too. The timeline element is something seen in software like Mixmeister, but The One looks to make it a key part of workflow. 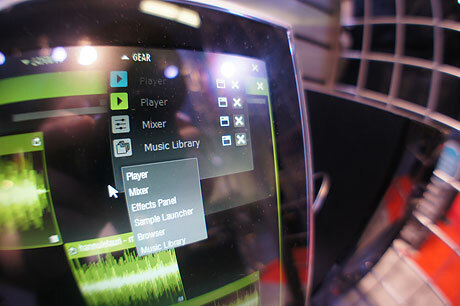 Introducing The One, the new breed of DJ software. The One is a fully modular DJ software that combines the traditional deck based approach to DJing with creative possibilities of timeline editing. Espoo, Finland - (January 17, 2012) – Audio Artery, a software arm of the company that also brought you innovative EKS controllers is proud to announce the arrival of The One DJ software. The One is a new breed of DJ software that offers new level usability and features while staying close to the roots of DJing. For the first time amongst DJ software, The One allows total customization of your working environment. Choose the gear you need and arrange it exactly the way you like. Everything you see on screen can be freely moved and resized. The advanced Timeline Edit mode turns player decks into powerful and easy to use audio edit stations, in which you can chop or combine tracks or even create complete DJ mixes while the track is still playing. Just drag tracks, audio clips and samples to the timeline from the browser. Snap to grid functionality makes synchronization of clips fast and easy. The rock solid audio engine guarantees no to stalling even when seeking or scratching simultaneously at minimal latencies. The One's modular audio routing system allows effects and mixers to be assigned to anywhere in the audio chain - meaning that effects can be placed between players and mixer, or used as master effects. The One is also designed to fully utilize the possibilities offered by today’s and tomorrow’s DJ controllers via advanced midi mapping possibilities. One Core edition featuring all the essential DJing elements is currently in beta testing stage and will be available this spring for the price of 49EUR/59USD. A feature packed premium edition will be released later in 2012. Pricing for premium edition has not been set at this time. For additional information on The One software, please contact info@whoistheone.net or go to address www.whoistheone.net. Audio Artery is a software arm of a finnish company Voimaradio Oy. Audio Artery is 100% about Code; software, firmware development, drivers and integrated hardware solutions. Audio Artery was formed in 2010 by a select group of DJs and software engineers who shared the same vision and passion for code. I got a few pictures including our very own Jared Helfer managing to contain his excitement at the potential of The One. EKS, made Bison s/w, look how that turned out? Keep developing your The One s/w. BTW, I hate security code captas that don't allow recycle to another READABLE code! this looks very interesting!! keeping my eye on this! thx 4 the vid!!! As a Torq 2 user i have o say The One will rule them all!!! I could see this being useful for me as a production tool. I like the idea that I can hide stuff that I don't use… most DJ software is full of fiddly bits that I don't need or understand.